I came upon this opportunity for students to interact with the inventor of first video game system (via e-mail questions) as a result of the instructor's willingness to allow me to extend myself and use precious classroom time to further educate students in non-traditional ways. The students opportunity to learn from this experience did not end there as they proceeded to learn about Ralph Baer's invention in greater depth from a hand-out I produced and from doing Internet research about this inventor of the first video game system. With the stage set, the students made up meaningful questions to better understand the life of this famous inventor and be motivated by him. In class, students were given the opportunity to read the answers to their own questions to the rest of the class with that knowledge that they may one day see their question in print. 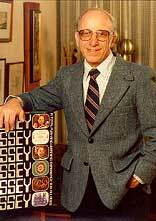 This is the image of Ralph Baer proudly standing next to the first video game system (Odyssey) that was released in 1972. 1. Was there anything you wanted to invent but it was too hard?
. But a person may invent something that is too hard to convert into a real product or a service for a lot of reasons, mainly financial ones. But that's another long story. Where do truly novel ideas come from? Do they drop out of the sky like lightning and enter the inventor's brain like something from outer space? If it's a truly novel idea- a Eureka!- then there is probably something in the professional experience of the inventor that caused the novel idea to float to the surface of his or her consciousness. Since you are interested in how video games came into being, I'll tell you this. My idea for using a home television set for playing games didn't come out of a vacuum. I had many years of experience in electronic design, especially in television receiver design. Therefore, I had both the incentive for "doing something new" with a TV set and I had the technical expertise to see how it might all be done, looking at the design problem from an engineer's point of view. As an engineer, it was natural for me to do that just as soon as the idea for doing games occurred to me. That's number one. Some of us have the education and training to convert ideas into real things. Some of us are willing to work hard to make dreams real. and who would want one, anyway? 2. Who was the first person to test it (the first video games system)? Answer: My technician Bill Harrison and I played our first chase (which he won) on May 15, 1967. 3. How long did it take you? Answer: From the moment of inception on September 1, 1966 (when I wrote a 4-page disclosure paper laying it all out) to the end of the development cycle during which we built eight consecutive, ever more complex game consoles (ending with the "Brown Box"), it took about two years. 4. What's your favorite invention that you made? The invention of video games has to be at the top. Mr. Dan Arnold's introduction to Ralph Baer, who is known as "Father of the Video Games," fit perfectly into our fifth grade invention unit. The students viewed many video game overlays including Odyssey's ping-pong game that would later become Atari's "Pong." They also saw the image of the arcade game "Journey," that used Ralph Baer's technology of digitized photography in gaming. The students were allowed to ask Mr. Baer questions, which he ansered through e-mail, via Mr. Arnold. They learned a little about Mr. Baer's personal life, his journey as an inventor, his patents, and how he was affected by our business world. They also learned that Mr. Baer is still inventing. Thank you Mr. Baer for taking the time to share with our class. We also thank Dan Arnold For bring a modern touch to our invention unit! 5. How did you come (up) with the video game system and specific games? Answer: Once I had come up with, and documented the very concept of playing games on a home TV set, I put on my engineer's hat and asked myself what I could put on the screen that would require a minimum of electronic part (hardware) and still result in a playable game. The answer was to design circuitry that would put two player controllable spots which could moved all over the screen by the players. With these two, we could play simple chase games (one spot chasing another and wiping it out upon contact) and we could "shoot at the screen with a simple photosensitive "gun" and play target shooting games with stationary and moving target spots. 6. What was the hardest invention? Answer: If you mean, which invention took the longest to convert into a working model, then I would say it was the video game. 7. What was your least favorite invention? I don't have any "least favorable" invention, but there are a few inventions among my inventions that are relatively trivial and insignificant. I would like to thank everyone who played a part in this exciting research project. Without Mrs. Stewart's investment of time, I would not have had the opportunity to make such a project happen within a school setting. Without Ralph Baer's faithful support in friendship and investment of the education of children, we would not have had the opportunity to put this type of interaction into place. Since this publication will be submitted for further publication to other organizations, be sure to check up on http://www.toylegacies.org now and then to see where your question has been in print. I'm very proud of you students! You have been eager to learn with a personal drive for innovation that was first evident in your project to invent toys yourselves. Have a blessed day and do not hesitate to contact me to talk about my toy/video game history research endeavors. 8. How old were you when you started inventing? 9. Are you still inventing?
. Go into a Toys-R-Us store and look for "Talkin' Tools" by Tonka or Playskool (both Hasbro companies). 10. Did you go to UCLA? .Secondly, while a good education is absolutely essential in this technology-intensive world, there are many ways to educate yourself. Large numbers of our most famous U.S. inventors never even saw the inside of a college (Think of Edison for example.) or left college early because they were way ahead of their teachers through self study and superior brain power (like Bill Gates, for example). Technology is moving at an accelerated pace. I thank Ralph Baer for starting the era of video gaming that became a major part of my entertainment in my youth with friends.